Read also: What Do We Know About Miss Haruna's Family? ← Why Did Rei Pursue Mamoru in the Anime? Same here… no matter how much I may know in my heart of hearts that she’s probably supposed to be associated with wood/plants, I just can’t see it. Her Supreme Thunder pose (which was an interesting article in its own right! ) is just too iconic! The anime definitely ran with the electricity theme too, so I’m wondering if maybe it was also more popular with Japanese fans too. Would love to see more about it, but since there are almost no manga-based products, it’s hard to compare. The nature theme fits better with her primary colour. But the electric based attacks are arguably better looking. Let’s face it, throwing petals and leaves at someone doesn’t have quite the same effect. But I think this dual ability can be looked at as representing two sides of her personality. The gentle easy-going Makoto is represented by nature. And the fierce when roused, by thunder. I feel like if they worked at it a bit more in the anime they could make it work — I mean, Sailor Venus has her “Love Me Chain” and “Love and Beauty Shock” attacks, to say nothing of all the cutesy attacks launched left and right in the Pretty Cure anime (… speaking of which, I still need to watch Pretty Cure someday). But I think you’re right. No matter how much they tried to work with it, I don’t really think the plant/nature theme really suits Sailor Jupiter’s fighting style and personality. 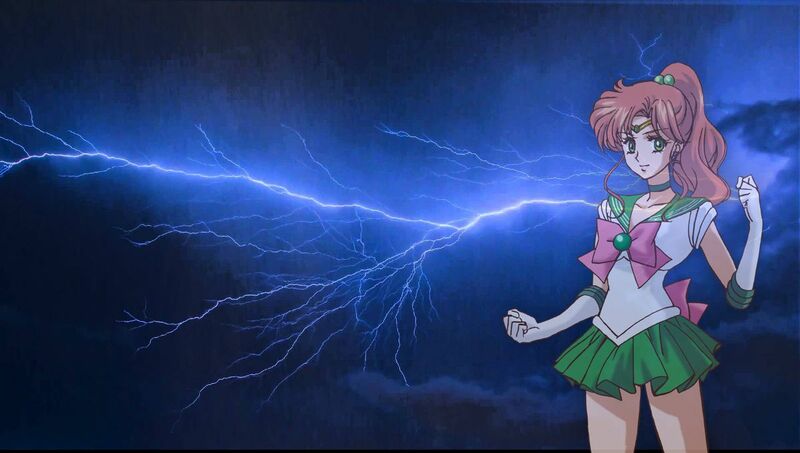 I mean, sure, Makoto does a lot of cooking and one of her key personality traits is that she is not only tough but really big into domestic/homemaking hobbies, but I think as Sailor Jupiter she’s more of the tough fighter of the team, and the sheer, raw, unfocused power of lightning just fits her so much better. Why not both elements? Lightning exists in nature, and they have a tendency to hit trees. 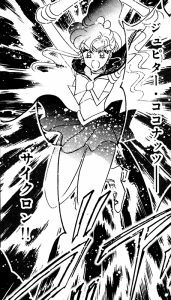 And Supreme Thunder first hits SAILOR JUPITER before being redirected. More than likely, this is probably the best way to look at it, especially when you consider that (to the best of my knowledge, at least…) electricity isn’t one of the classical elements so it would make sense for it to be included into the wood/plant category. To be fair, though, Ms. Takeuchi got a bit creative with her theme (I’m hesitant to use the word “element” here) use for Minako as well, seeing as she kind of goes between metal and “love” on a whim. That is something to talk about some other time, though! So, in Feng Shui, which is where the elemental associations with the planets came from, Wood is associated with wind and lightning as well. The Wu Xing, or five “elements” are not quite what Westerners think of. It’s more about different flows of energy, and the phase of “mu/moku” is properly “like a tree swaying in the gentle breeze.” Interestingly, Japanese practitioners of Chinese mysticism tend to link lightning to the phase of “metal.” I think a mild relation to wind exists in Makoto’s powers, such as Flower Hurricane and Jupiter Coconut Cyclone. I have to admit that my knowledge of Feng Shui is limited, but that is interesting that wood, wind, and lightning would all be associated. I never actually thought there would be a connection to it, but it does make sense in a certain light! That also makes Sailor Jupiter’s later attacks — ‘Hurricane’ and ‘Cyclone’ — make more sense. In that case, it looks like Ms. Takeuchi did a pretty impressive job of trying to link them all together. You really have to wonder how many reference books and library trips she went through when drawing this manga in those primitive internet days! Also oak tree is one of the symbols of Zeus. So it does relate to Jupiter on the Greek/Roman and Japenese mythology. Oh, I didn’t catch that, but you’re absolutely right! It’s nice to see that there actually was some sort of reasoning behind her connection to the two seemingly unrelated elements! I think that there are many layers to the characters that are created here. I think Ms. Takeuchi is extremely smart and did her research and blends Greek/Roman mythology with Japanese myth and Chinese Feng Shui quite brilliantly here. I think that Makoto definitely can be both lightening and nature in general. Zeus throwing the lightening bolt and being the symbol of the oak tree, I just think she did a good job giving the characters variety and making clever attacks. I’m sure it’s something of a cop-out to put it this way, but I definitely prefer to think of it more like Jupiter is Lightning AND Wood rather than a matter of “or” and having to choose between the two.